Nitrogen deposited in high elevation ecosystems such as Rocky Mountain National Park (RMNP) affects these systems much differently than similar loads of nitrogen applied to lower elevation systems. The shallow soils and granite bedrock found in the Park lead to low chemical buffering capacity, and the short growing seasons at high elevations limit nitrogen use during the year. As a result, nitrogen loads as low as 1.5 kg N/ha/yr can lead to harmful ecosystem impacts in the Park. Pre-industrial nitrogen loads in RMNP are estimated to be around 0.2 kg N/ha/ yr, while current rates of deposition approach 3 kg N/ha/yr, or ~15x natural background levels. Agencies involved in the RMNP Initiative have set a target resource management goal to reduce wet nitrogen deposition down to 1.5 kg N/ha/yr (1.7 lbs N/acre/yr). 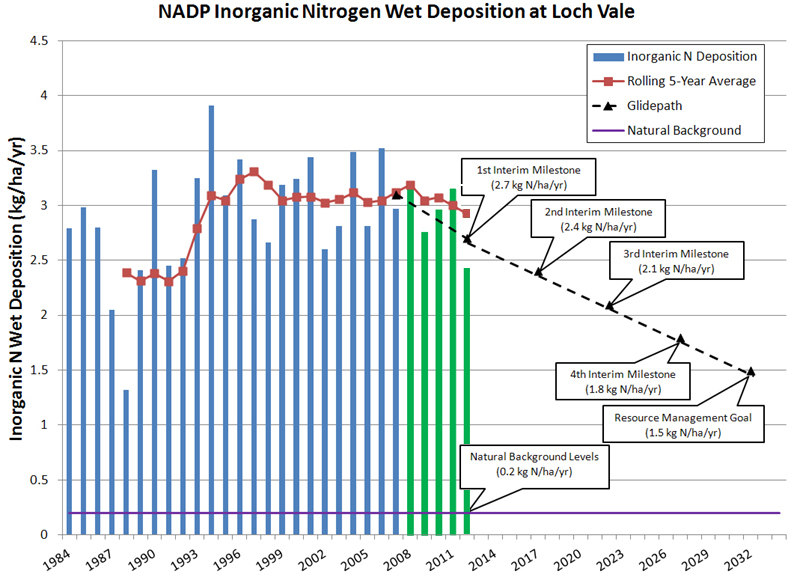 Wet nitrogen deposition at Loch Vale in RMNP has been monitored as part of the National Atmospheric Deposition Program (NADP) since 1983. Wet deposition occurs as reactive nitrogen compounds in the air are scavenged by rain or snow and deposit on soil, water, or vegetation. Increases in nitrogen deposition have been observed since monitoring began, but recent trends are relatively flat. When monitoring began, approximately half of the nitrogen deposited in oxidized forms (NOx, mainly products of combustion) and approximately half was reduced nitrogen (NHx, primarily from animal wastes, fertilizer, etc.). In recent years, ammonia/ammonium deposition has increased to almost 60% of the total wet nitrogen deposition. Wet nitrogen deposition at Loch Vale in Rocky Mountain National Park. Green bars indicate deposition values since adoption of the Nitrogen Deposition Reduction Plan, and the “Glidepath” represents target deposition rates to reduce deposition to the resource management goal of 1.5 kg N/ha/yr by 2032. Excess nitrogen in lakes and streams on the east side of the Park, which has led to alterations in diatom species (algae) in these lakes, an early indicator of declining aquatic ecosystem health. Changes in plant species – grasses and sedges are outcompeting flowering plants, which change habitat for some animals. Old-growth Engelmann spruce forests on the east side of the Continental Divide show significantly altered chemistry relative to similar forests on the west side, potentially impacting the trees’ ability to withstand pests and affecting forest health. Enhanced microbial activity in soils that is driven by excess nitrogen, which is altering biogeochemical cycling processes, producing even more nitrogen. Nitrogen deposition rates were about 2x higher in the summer than in the spring and resulted from very different meteorological processes. In the summer, significant deposition occurred almost daily, as a result of convective activity. In the spring, virtually all of the wet deposition resulted from a single, large-scale, upslope weather event. Prediction of these large upslope events is the basis of the pilot scale early warning system being developed and tested to try to reduce agriculture’s contributions to nitrogen deposition impacts in RMNP. In both the spring and summer sampling periods, average nitrogen concentrations in the air were highest in northeastern Colorado. During the spring, the split between in-state versus out-of-state nitrogen sources was about 67:33; during the summer, the split was about 53:47. In general, lower levels of nitrogen emissions come from distant sources west of RMNP and are transported by the prevailing westerly winds. To the east of the Park are areas of high nitrogen emissions, including the nearby Front Range and agriculturally intensive areas in northeastern Colorado. The types of upslope, easterly winds that move nitrogen into RMNP are relatively infrequent; however, when they do occur, the Park often experiences its highest levels of nitrogen deposition. Blett, T. and K. Morris. 2004. Nitrogen deposition: issues and effects in Rocky Mountain National Park Technical Background Document. Malm, W.C., J.L. Collett, et al. 2009. 2009. Rocky Mountain Atmospheric Nitrogen and Sulfur Study Report. Fort Collins, Colorado: National Park Service. ISSN 0737-5352-84. Agricultural Best Management Practices: Helping to Reduce Nitrogen Impacts at Rocky Mountain National Park.